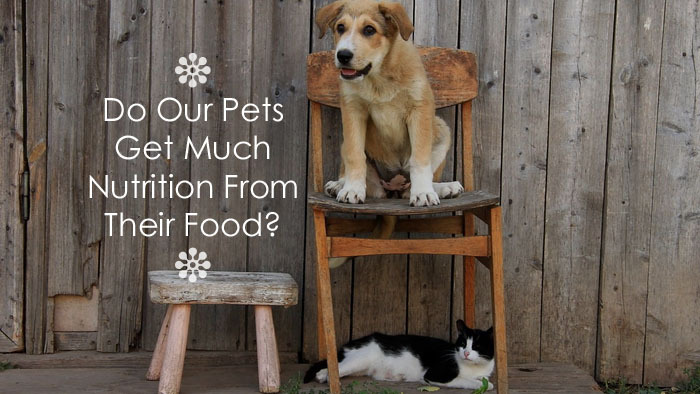 Do Our Pets Get Much Nutrition From Their Food? Just imagine if you were to put a handful of steel ball bearings into a bag of kibble. Could we then say that your pet would receive its daily recommended amount of iron from the cereal? Of course, not. We know that they cannot digest or absorb any of the iron that is contained in the steel balls. Yet we do something very similar with much of the food we feed our pets. Bioavailability refers to how well nutrients can be absorbed into an animal’s body after digestion. The issue is when we believe that we can absorb iron from steel ball bearings. In other words, when we see that a food product has a nice-looking list of nutritional elements, our brains assume that our pets will actually digest and/or absorb all of that nutrition. The reality is that our dogs and cats can only absorb a certain percentage of the nutrients in any food. How large that percentage is directly relates to the quality of the food and how species appropriate it is. Many pet foods contain grains which have some nutrients in them but cannot be easily digested or absorbed by a dog or cat intestinal tract. These grains are simple and affordable to have as an ingredient and look good on a label. Horses and cows (herbivores) digest grains well. Dogs and cats don’t. Over processing can render nutrients to have little to no value. Heat processing (cooking) reduces the digestibility of proteins and some amino acids. The proteins may be in the product but the animal will not fully receive nutrition from them. As well, generic “meat meal” or “animal meal” means the source of the meat may have come from almost anywhere, even from diseased or euthanized animals which should not be used as feed. Feeding our pets a species appropriate diet means we recognize what foods are best used by the animal. Cats are carnivores. They get their nutrition from meat. Feeding them grains and plant based carbs is not adequate at best…harmful at worst. Dogs are omnivores and can receive nutrition from meats, fruits and vegetables. How Do We Choose Foods With Greater Bioavailability? It’s quite simple. Stay away from processed diets whenever possible and feed your animals lots of fresh food from a species appropriate source. For dogs, as omnivores, they will benefit from quality meat protein, preferably raw. Also, many fruits and vegetables are easily digested by canines. Cats, as meat eaters, should keep away from grains and carbs and be fed quality meat protein. While a small quantity of veggies is fine for cats, the feline digestive system is not adept at processing them. Fibre is also a valuable component of a dog or cat’s diet. It aids in digestion, improves nutrient absorption and prevents constipation, among many of the other benefits we discussed in this post. At BiologicVET, we use a blend of organic defatted flax, sunflower and sesame seed fibre as a delivery system for nutrients. Whether you give your pet a higher quality commercial pet food or a raw meat diet, BiologicVET supplements are a carefully designed holistic system, formulated to work synergistically to maximize the nutritional content of your pet’s diet. The naturally-sourced ingredients are chosen for their high bioavailability of nutrients and the formulas are specifically designed to meet the unique gastrointestinal and metabolic needs of canines and felines.